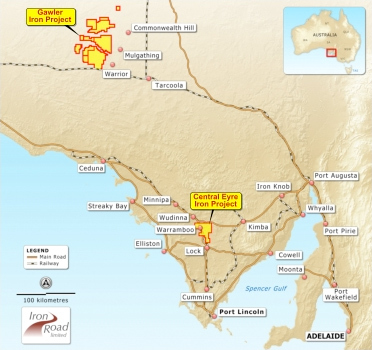 Iron Road is an independent, South Australian focused iron ore project developer. We are well advanced towards achieving our goal of becoming a substantial producer of high quality iron ore concentrates. Key to this strategy is the development of the Central Eyre Iron Project in South Australia. Iron Road intends to feed the iron pellet and concentrate markets of Asia, Europe and the Middle East, commencing with the production of 10 million tonnes of product per annum. Resource expansion drilling, further metallurgical test work and pre-feasibility study underway, including infrastructure studies. Current mineral resource is 328Mt @ 17.3% Fe. The Company has an internal goal of increasing the CEIP resource to 500Mt in the 2010 calendar year. The mineralisation drilled to date has returned average Davis Tube Recovery concentrate grades of ~70% Fe. Exploration potential of 2.8 - 5.7 billion tonnes of magnetite gneiss. Prior to Iron Road, the area has not been systematically explored for iron ore despite reconnaissance drilling of surface outcrops by the South Australian government in the 1960’s that identified several BIF-hosted iron deposits. The Gawler Iron Project is in South Australia, located along the eastern margin of the Great Victoria Desert some 200 kilometres southwest of Coober Pedy. The project tenements abut the Trans Australian Railway and are within 100 kilometres of the Adelaide-Darwin Railway. The Gawler Iron Project fits very well with Iron Road’s flagship Central Eyre Iron Project project and the Company’s strategy of investigating advanced exploration projects in close proximity to existing infrastructure. The Project area covers 3380km² and includes over ten areas of known iron occurrences, including the Mt Christie deposit which was the subject of beneficiation test work in the 1960’s by the South Australian Department of Mines. Iron Road entered into an agreement with Dominion Gold Operations to acquire the iron ore rights to 3380km² of tenements in August 2008. A detailed airborne magnetic and radiometric survey was flown over a 240km² area in September 2009 and involved a fixed-wing aircraft flying 50 metre spaced traverses at 35 metre nominal height for a total of 5320 line kilometres. This was followed-up with a ground gravity survey of priority areas in December 2009. Gravity data from totalling 6368 new stations were collected on a semi-regional 400x50 metre grid, closing down to 200x25 metres over the interpreted extent of iron formations. The new high-resolution geophysical data delineates several iron ore targets recommended for drill testing. In addition, 252 in-situ rock chip and grab samples were also collected from ten localities for analyses, returning an average grade of 53.4% Fe from all samples collected. Several in-situ chip samples returned grades greater than 60% Fe with low silica, alumina and phosphorous indicating potential suitability for direct shipping ore. The Company commenced its maiden drilling programme at the Gawler Iron Project in April 2010, consisting of approximately 80 drill holes to test areas of high potential. The programme concluded in May 2010. Also in May 2010, the South Australian Government awarded Iron Road a grant for diamond drilling at the Gawler Iron Project. Funding to the level of A$60,000 was been approved as part of the South Australian Government’s Plan for Accelerating Exploration (PACE) initiative under Theme 2 – Drilling Collaboration between PIRSA and Industry. Only 23 projects from 63 proposals were successful. The proposed diamond drilling programme, supported by the approved PACE funding, will test coincident gravity and magnetic anomalies potentially associated with recessive zones of iron enrichment. An exploration model similar to the style of mineralisation found at the Archaen K Deposit at Kollyanobbing has been proposed. Confirmation of this model would present a new style of iron mineralisation in South Australia. The Windarling project is located approximately 85km north of Koolyanobbing, Western Australia and consists of 3 granted exploration licenses and 4 prospecting license applications. This region has excellent infrastructure in place, with rail from nearby Koolyanobbing to the deepwater port of Esperance. The primary banded iron formation in the Koolyanobbing Range, which has been strongly folded and thickened, is composed of banded magnetite-talc schist, quartz-magnetite containing some pyrite, and siderite – massive pyrite containing some specular hematite, magnetite and graphite. The project is located in a significant iron ore producing area. The nearby Koolyanobbing Iron Project, operated by Portman Limited, has resources totalling 52.7Mt @ 63.49% iron, the majority of which are located between 2.5km to 7km from Iron Road’s tenements. Portman mines the deposits as a single operation, trucking the ore from Mt Jackson and Windarling to Koolyanobbing which is then railed to the port of Esperance for export. Exploration activities will target the potential continuation of the windarling structure on Iron Road's tenements. The Company’s Murchison projects comprise two project areas,Wanmulla and Rose Hill. The Wanmulla Project is located approximately 50km east north east of Cue, in the Murchison Goldfield of Western Australia. The project covers the eastern edge of the Mount Magnet – Meekatharra greenstone belt in the vicinity of Tuckibianna. The Rose Well project is located approximately 60km north east of Mount Magnet, Western Australia. The majority of the lease is interpreted to be gneissic granitoids however there is outcropping banded iron formations as enclaves of greenstone within the central portion of the project. It is likely that further enclaves of greenstone are present. Iron Road intends to investigate the potential of its Murchison projects, particularly beneath the surface alluvial and colluvium cover.